Superb Condition, CARFAX 1-Owner, GREAT MILES 2,015! EPA 34 MPG Hwy/23 MPG City! SE trim. Smart Device Integration, Dual Zone A/C, Remote Engine Start, Brake Actuated Limited Slip Differential, Cross-Traffic Alert, Blind Spot Monitor, Lane Keeping Assist, Turbo, Alloy Wheels, TRANSMISSION: 6-SPEED AUTOMATIC, Back-Up Camera, Onboard Communications System, iPod/MP3 Input, Satellite Radio, Serviced here at Galpin, Originally Sold at Galpin, Used Dealer Rental Vehicle. 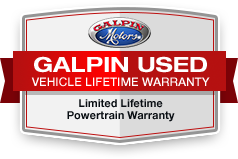 If (a) an inspection by Galpin determines that the vehicle is in the same condition as when delivered and (b) the vehicle has not been driven more than 250 miles since the time of purchase. Dealer will not offer the cancellation option agreement (3-day money back guarantee) to an individual who has exercised his or her right to cancel the purchase of a vehicle from the dealer pursuant to the contract cancellation option agreement during the immediately preceding 30 days. Excludes Leases. All figures are EPA estimates. Actual mileage will vary. Kelly Blue Book values are calculated based on the current Retail Book. Pricing analysis performed on 2/26/2019. Fuel economy calculations based on original manufacturer data for trim engine configuration. Please confirm the accuracy of the included equipment by calling us prior to purchase.